If you think etiquette is boring, outdated or unnecessary in modern society, think again. Although our culture has become less formal in many ways, their are still rules and expectations in all types of relationships and situations. Giving students the confidence and courage to successfully navigate any situation from job interviews to dates, dinner parties to networking events, and everything in between will give them the advantage. First impressions are formed in an instant, but can impact a relationship forever. Katherine Mason Young makes learning social conventions easy, fun and even exciting. Learn how a powerful social education can open the door of opportunities and in advantageous positions while providing the skills necessary to becoming a successful leader. Her wisdom allows students to navigate real life situations with confidence and class, and her interactive and entertaining teaching style keeps them engaged throughout the process. 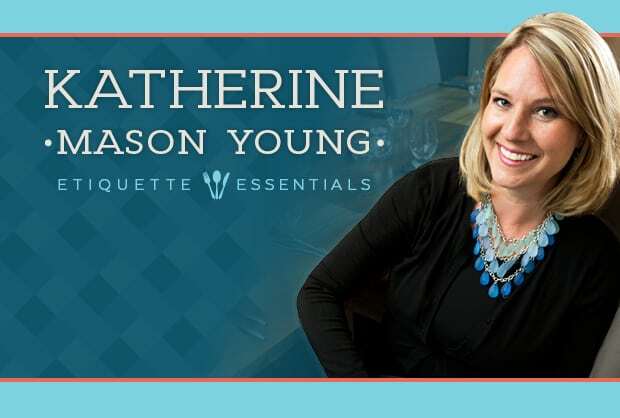 Katherine Mason Young has been speaking and instructing social skills, confidence and etiquette courses nationally with the JDW Social Education Programs for over 18 years. She is a graduate of the University of Colorado with degrees in International Business and Marketing. Katherine received her greatest cultural education while traveling around the world on the S.S. Universe – Semester at Sea. She then worked protocol during the World Economic Summit of the Eight, and has extensive international travel experience. Katherine has appeared on CBS Sunday Morning, national television news broadcasts and KNUS – Success Talk Radio program. As Executive Director of ESP (Executive Social Presentation), her projects include corporate seminars nationally, in addition to regular engagements for Rocky Mountain Jr. Achievement, Leaders Challenge, The National Charity League and several academic, volunteer, and debutante organizations nationwide. Katherine is a Colorado native and enjoys skiing, hiking, canoeing and camping. In addition, Katherine instructs Swing, Latin and Ballroom dancing. Let’s face it: good social skills are some of the most valuable and visible assets a person can have. However, many people are intimidated by the idea of networking, interviews and participating in social events. It seems like there are so many rules and customs that inevitably, you’re going to do something wrong. In this engaging keynote, Katherine Mason Young transforms the age-old idea that etiquette is stuffy and boring and makes it a fun learning experience for audiences. She helps students explore etiquette essentials that will help anyone fit in, land the job or opportunity they desire and achieve greater success both personally and professionally. Having an understanding of social etiquette allows us to be comfortable in navigating dating, interviews and sticky situations with ease. From the importance of eye contact, to where to put your napkin, Katherine brings etiquette to light in an engaging and interactive way. In today’s competitive society, employers will purposefully take candidates to lunch to assess their social intelligence. You can tell a lot about someone by the way they handle themselves at the table, and there are some great skills you should employ to make a great first impression. One thing is certain, understanding etiquette and manners provides a significant advantage in the world. If you need a keynote for campus that helps answer questions like: what do I say now? Which fork do I use? Should I shake hands or hug? or, should I send a thank you note? – then Etiquette Essentials is here to help! answers to their questions about appropriate actions to take in specific situation that might not be clear. “Let’s dance” is a fun, interactive and social way to bring excitement to your next social mixer. Participants can choose from a variety of “themes” including swing dance, Latin dance or classic ballroom steps. Katherine breaks down the steps, making dancing easy for even the most novice, shy or awkward students that will help them to catch on quickly. Dance is an inherent part of our culture, and a skill you can use for a lifetime. Give your campus the opportunity to connect in a healthy, fun and respectful way. how to demonstrate respect and appropriate conduct between dance partners. Thousands of recent graduates are on the job hunt. The anticipation of this critical life step can be paralyzing. The good news? The good old-fashioned social skills that mom taught could ultimately help graduates land a job. The fact is, individuals who are capable of being comfortable and presenting themselves in the best possible light, will ultimately have a significant advantage over their peers. USA Today reported that the average interviewer will determine your potential within three seconds! In other words, just by looking at a candidate they will know if they will fit into their organization. Katherine Mason Young provides all the insights needed to accomplish this crucial next step in everyone’s life with confidence and ease. learn tips and tools to put their best foot forward in job interview settings.